This is great Amina, and may I add decency along with respect, with us learning to be gentle. A great place for any-one to start as you have shared and this will have a “ripple effect” not only on our-self but also all those whom we have a relationship with. Amina, you have beautifully highlighted how building a deep and loving relationship with ourselves is the foundation to all our other relationships, and how these ripples of love simply keep expanding and expanding and expanding. Love knows no bounds. Relationships are the considered source of so much ill and problems in this world. Or are they? What about our own relationship with ourselves? Have you ever noticed when someone is feeling content and at ease within themselves how much easier, lighter and play-full they are to be with? This is definitely a science worth exploring. 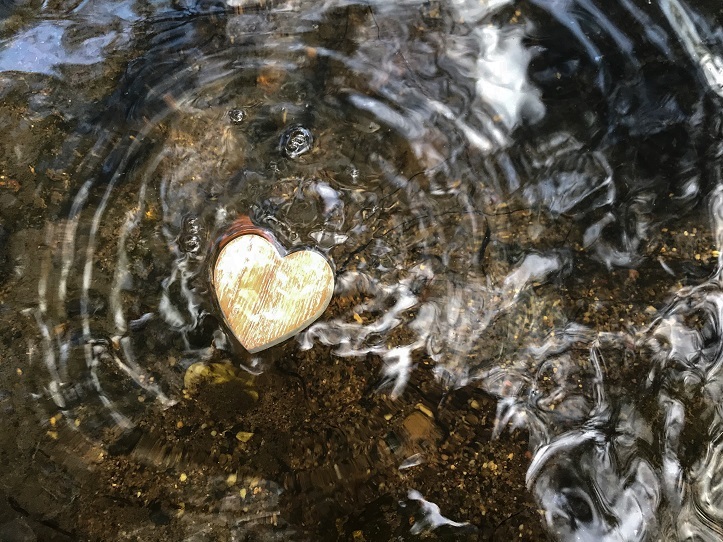 Allowing ourselves to see beyond an action, choice or behaviour and observe the ripples that come from this, truly support in motivation of change to become more loving…. then watching the ripples come from a greater self-care is beautiful. ‘We need to create stop moments in our day to really consider how we are truly living on a moment to moment basis and the effect that this has.’ This is a great point, Amina, we tend to keep going and going thinking that the more we do we are being productive, but if we are not connected with our body, then the quality of everything we do is less. Thank you Amina for sharing so insightfully how our relationship with our self is the foundation of how we are in all our other relationships. Being in a relationship without the need to try.. this is very beautiful, and how relationships naturally can be, when we give ourselves permission to let go, and be raw, honest and vulnerable- open to just being with what we’re feeling, without the need to feel differently. Beautiful post Amina. Looking after ourselves – with love and care in its quality – makes so much sense. The ripple effect that goes out to others is tangible. I am learning that we make life so complicated by our emotional issues, and in this we can avoid being honest because the focus becomes the issue and not what is really going on. Your question “what would the day look like if we started free of all these emotions, and instead were full of joy?” For me there is a flow and purpose in everything I do and life becomes about the bigger picture, it is a totally different way of looking at life and people can feel this. Love the practicality you share here Amina to bring ourselves back to love through self-care and self-nurturing ways, as the foundation for all relationships to flourish from..
‘My life consisted of focussing on my work first and foremost, and so long as I was able to fit in everything I had to do, along with the ‘to do’ list I always had with me, then I was managing life. But because I was so exhausted there was a limit to the depth of quality I could bring to all areas of my life.’ Nowhere, apart from pages like these, do we discuss how we have prioritised function over quality. With our current rates of ill health, obesity, substance addiction (including caffeine and sugar), not to mention depression and other mental health issues it really is time we started to seriously engage with this topic as a whole. It is greatly overlooked in the world but our most important and foundational relationship is that which we have with ourselves. And you are so correct in saying that the quality of this relationship we have with ourselves ripples outwards and feeds all our other interactions and relationships. Absolutely how we live definitely affects both ourselves and others around us and the most important relationship I would say is the one with ourselves, are we being honest with what we are feeling, are we overriding what we are feeling and are we willing to express what we feel and to really deeply love and care for ourselves. Also as you have shared if we are in anxiousness, frustration, sadness or anger, etc and do not stop to feel, resolve, heal and change this then the emotion will carry on with us in everything we do throughout our day …. week … month … year … lifetime! The continual cycle of life exposed in the practical fact that how we feel in the morning is a direct result of how we felt and chose to be the day before and that it is in our hands to make the changes. The way we get up in the morning does impact ourselves and others. To realize this, and feel it makes us more responsible how I am living. Because I do know there is a different way for me to live, and for others to live and by knowing that I cannot avoid anymore saying that it is just the way it is. What I’m learning is that when anything comes up in a relationship or doesn’t feel true/flowing, ALWAYS look at your own part to play, responsibility and track record of how you’ve been living recently FIRST. You can spend hours pointing fingers at another when it turns out there has been something huge you haven’t been expressing, or a quality you have dropped in how you live e.g. respect, love, care, understanding. Yes agreed, Amina. The quality of our relationship with ourselves and level of self worth affects the way we breathe and move through life, and this is what others receive from us. It is so important to be aware that everything we do does effect the all, the ripples we create are far reaching, so why not send out the positive if for no other reason that is what will eventually come back. Your beautifully honest blog Amina had a gentle ripple effect on me. A reminder of how important it is to set a foundation in our lives: before going to bed, clearing what needs to be cleared and going to bed early. On waking, gently nurturing ourselves into the day and preparing for whatever work we do. And pauses during the day, to re-align, we often overlook these. The quality of relationship with self felt by everyone we meet. “We need to create stop moments in our day to really consider how we are truly living on a moment to moment basis and the effect that this has” – agree Amina, to stop is to allow yourself the space of reflection in which to reach understanding. And it is through understanding we can let go to accept the whole of us, and also of another too to develop true relationship. I have noticed that we do tend to have a belief or an attitude that we can be in a mood or emotion and that it somehow does not affect anyone else, however what you say here Amina feels very true to me that really everything we do does have a ripple effect on everything else around us. For so long my picture of Responsibility has been one of owning a house, having a mortgage, paying bills, a car to maintain and insure, having a family to support & bring up – necessary and important aspects of life that were however all detached from myself. I can concur with all that Amina has shared, making the way i live and my relationship with myself my core responsibility offers a steady harmonious medicine that no-one should live without. I noticed a pattern of how I would hold everything in, not expressing and building up reactions or things to be expressed in my day and then wait to express it all to someone in the evening, sometimes as they were going to bed. And yes, while there is something to be said of expressing ourselves and not taking it with us to sleep, there is also a consideration of how and when we do this. If I have stimulating conversation just before sleep, I find it disturbing. I have set a new no go area now for my bed – it is not a place to use my phone or computer or talk or even mull and obsess over the day, or think about the future, it is a place to support me and a place set up for me to feel safe and at ease to deeply surrender, and I can find time earlier in the evening or day to express when needed. The first relationship is with ourselves. This is more commonly know these days but often interpreted as putting ourselves above others. It is the realisation that the quality that we hold ourselves in determines the quality that we hold others in that brings up the truth of this saying. Beautifully put, Carolien and because it is the quality that we establish by building the relationship with ourselves first there is nothing ‘selfish’ about this. It will certainly be a very long and tiring day if we wake up already feeling out of sorts from the day before, and probably not having slept well as a result. But not only will it be a challenge to us, but also to those around us as we will be rippling out how we are feeling in every moment. It all comes down to our responsibility as to what quality we move in, in this world. And isn’t that often the normality of daily living, that we do wake up day after day like that – I know I used to – one issue piled onto the next issue, and the next, all unresolved, all festering somewhere inside of me, and in the end turning into an illness of some sort. In time we will all see for ourselves that we do not need to live holding onto issues, and hurts, we can deal with them lovingly and honestly and move on. You had me at “Relationships present an opportunity to evolve in one’s own relationship, along with all others equally” Recently I’ve been so focused on the other person that I’ve forgotten that where my focus needs to be is how I am with myself, because thats the quality I take to everyone else. Starting the day and shining long before the sun gets its chance, is how I enjoy starting almost every day. Even if the sun is obscured by dark clouds when it arises, I continue to shine for everyone. I love this Steve, I used to get up a lot earlier than I have been for some time now and I can really feel the difference. Now I don’t give myself as much time to get ready and it’s just another task to do before I get to work, instead of something to really enjoy and then take that with me to the next place. We are all pebbles in the pond of energy in which we live and how each and every one of us lives adds to the turbulence or stillness of the pond. My daughter often talks about how ‘splashy’ the swimming pool is when she has swimming lessons and how it upsets the stillness of the water. It makes no difference if we are seeing the splashes or not we are still adding to this pool if our movements are not in line with the universe. ‘We need to create stop moments in our day to really consider how we are truly living on a moment to moment basis and the effect that this has’. I was in a recent discussion with some-one and we were talking about how we can deepen the quality of our being in this moment to moment. Being aware of how we are moving, are we moving with our body, with our stillness or are we moving not fully present? Everything counts, and everything is clocked and yes everything has a ripple effect. When we deepen our quality, this is what is fed back to us. Its not even restricted to the very obvious impact we have on others when we move with more space and more of ourselves. Somehow the day moves more smoothly, the universe itself responds to the ripples in ways that are almost impossible to understand…. and yet are very practically and really happening. The effects of living in a world of energy we are always in a pool of energy of our own choosing. Whether I am on the receiving end or living in disconnection to myself through carrying out emotional behaviours I have a responsibility to either hold myself in love or change my movements to loving ones so I feel in connection to myself but whatever way is being asked of me it is the responsibility that I have towards myself that has a knock on effect around me and beyond. There is definitely a ripple effect in everything we do in life as when I take a step back and observe life I can clearly see its movements. Many people are moved by the emotion of the day, be it the whether, what is on the news, issues at home or in the work place etc. so for me no scientific study is needed to prove the ripple effect exists. Therefore that what Amina is presenting in this blog is worth considering and to put into practice for each and everyone of us. I am wondering how life would look like if all people in the world would take their responsibility and live like that. And if we start to realise and accept the ripple effects of our choices and behaviour we can begin to understand all the impacts of all the ripples out in the world from all of us and the importance to have a very steady standing for ourselves so that we are not simply flotsam and jetsam in amongst it all. “We need to create stop moments in our day to really consider how we are truly living on a moment to moment basis and the effect that this has.” – I feel that you raised a really powerful and poignant point here Amina, because society as a whole is not only super exhausted and thus not able to see the ripple effects of their choices, but they are also wired on multiple stimulants like caffeine and sugar to keep them going, which makes it that much more difficult to take a stop moment as you suggested. That being said, I know for myself that there are many times when I have taken a moment to check in with my body and noticed just how far ‘out’ I had gotten (especially at work) and then took the steps to come back to breathing and moving my body with gentleness which changes everything. Beautiful blog Amina, the ripple effects are huge, we cannot control how they work. It happens naturally and they show us how connected we all are. The ripple effects also remind us that we all have a responsibility with regards to how we express, how we feel, our intentions, actions and behaviours etc. I now know pretty much everything we do matters and affects everyone. We may not see or feel these ripples immediately but they are definitely present and are communicating further than our eyes can see. Amni the ripples you talk about are a great way to look at life and really see the difference that our choices make, I know that sense of ‘being super busy’ and the difference it makes when we stop and take care of ourselves, making that part of our daily life. Then what I’ve also found is that I feel less busy but end up completing more things. And the people around us feel the difference – and can’t help but respond to that. Thank you for sharing Amita – this makes so much sense. How we are has a ripple effect on others and we have a choice in how we are. Full of joy or full of hurt. And then it is a case of people around us feeling this. So all in all – we play a much bigger role than we think, and we have a responsibility in how we are. Beautiful practical blog Amina. Thank you! Yes Lyndy, there is definitley beauty in the simplicity that making things very practical brings to life. It’s common to find we forget these self-loving actions when a partner comes along. ‘Oh i’ll do it later’ we say. But your sharing Amina clearly emphasises just what a crucial role our self-nurturing plays in supporting everyone, not just ourselves. Sometimes the focus shifts from ourselves to the other when a partner comes along. Like we forget about ourselves and make the other and the relationship more important, but this doesn’t work without the foundation of a connection to ourselves.